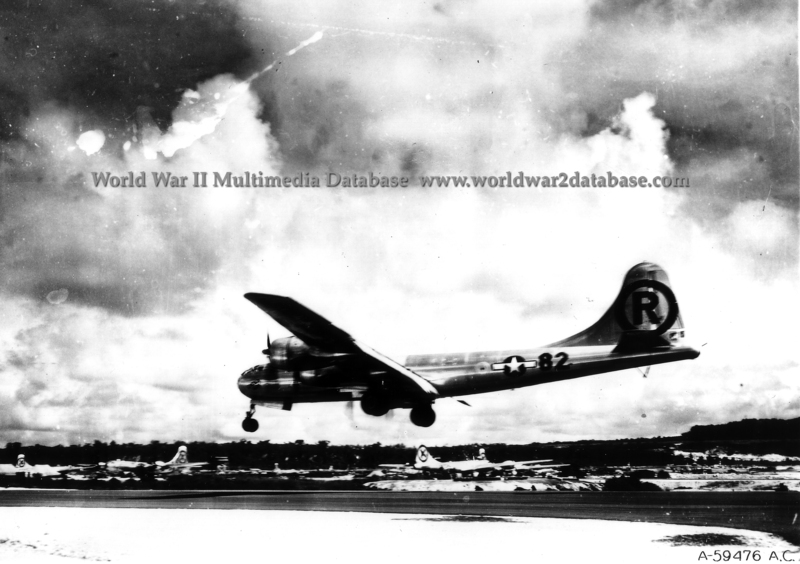 After dropping the "Little Boy" atomic bomb on Hiroshima, "Enola Gay" B-29-45-MO serial number 44-86292 encountered a single Japanese fighter that did not engage. The mushroom cloud could still be seen an hour later when Enola Gay was 360 miles (579 kilometers) from Hiroshima. The Enola Gay landed at North Field, Tinian, at 1458 Hours. The Great Artiste (B-29-40-MO 44-27353, victor number "Dimples" 89) the scientific plane, and Necessary Evil (B-29-45-MO 44-86291, victor number "Dimples" 91), the photographic plane, landed a few minutes later. The Enola Gay was airborne for twelve hours and thirteen minutes.